The Themes: One of the most “modern” of Shakespeare’s plays, Twelfth Night’s themes are about the fickleness of love, the arbitrary nature of relationships, and the re-thinking of sexuality. 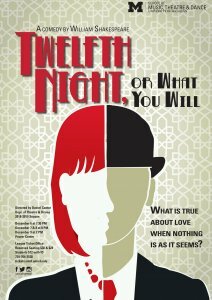 Twelfth Night explores the nature of desire and how perception is clouded by desire. What is disguise and what is truth is never absolutely certain; they are often in the eye of the beholder when we fall in love. The Plot: It is a romantic comedy about twins Viola and Sebastian, who are separated during a shipwreck. Believing her brother dead, Viola disguises herself as a man and enters the service of Duke Orsino. The Duke believes himself to be in love with Olivia, a beautiful countess. Olivia, however, is swiftly falling for the disguised Viola. In the meantime, Viola is developing feelings for the Duke. When Sebastian, who is not dead after all, arrives in town, confusion reigns supreme. Unrequited love and mistaken identities abound as the foursome journeys towards a joyous discovery.